Moses asks God, “Who am I?” And Yahweh responds by speaking about himself, “I, the Great I AM, will be with you.”¹ What a strange response that more than answers Moses’ question. Don’t miss the beauty here. Moses doesn’t have to be somebody great; Yahweh already is. Moses groans with deep inadequacy and nobody-ness. BUT, the saving, personal God of Israel is there with him, so it doesn’t matter. Who Am I? Moses, you’re the man with whom God is. He doesn’t need to force Pharoah’s hand because Pharoah will be challenging the I-AM-with-Moses God. It was his total identity. Why? God had committed himself to a covenant to eternally dwell with Moses and his people.² Repeatedly, the Lord declares, “I will be their God and they will be my people.” So, when Jesus (the greater Moses) comes and is given the name Immanuel it means that Yahweh has kept his promise and can be found living with his people — forever. Who Are We? Church, we are his people, and he is our God because he committed himself to be there, with us. It IS who we are; our new and complete identity. In the eyes of this world, most of us are not elite, enabled, dripping-with-talent, accomplished, well-off, employees-of-the-month, or even parents-of-the-year. But, in Jesus, we don’t have to be known as any of those things because we already are known by the one who himself becomes our identity. 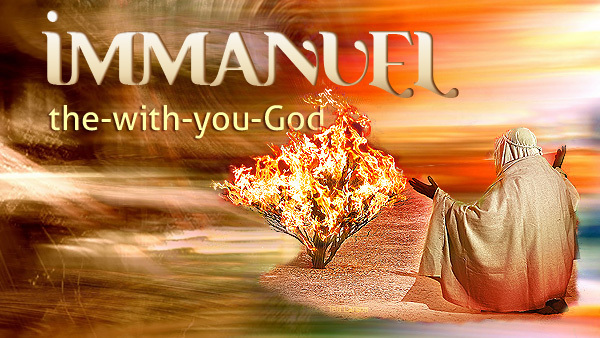 Immanuel is the-with-us-God. That’s how I want to be known, don’t you? ¹ ‘ehyeh ‘immak — “I AM, with you” — you can see the “imma” that forms the name Immanuel. ² I am indebted to John Frame in his work The Doctrine of God for pointing to the covenant presence of God (ch. 6). Some of my thoughts in this article were “ignited” and adapted from him.